KIEV, Ukraine — Early results in Ukraine’s presidential election show a comedian with no political experience maintaining his strong lead against the incumbent president in the first round, setting the stage for a runoff in three weeks. “This is only the first step toward a great victory,” Zelenskiy said after seeing the exit poll findings. Poroshenko, 53, a confectionery tycoon before he was elected five years ago, saw approval of his governing sink amid Ukraine’s economic woes and a sharp plunge in living standards. Poroshenko campaigned on promises to defeat the rebels in the east and to wrest back control of Crimea, which Russia annexed in 2014 in a move that has drawn sanctions against Russia from the U.S. and the European Union. A military embezzlement scheme that allegedly involved top Poroshenko associates as well as a factory controlled by the president dogged Poroshenko before this election. Ultra-right activists shadowed him throughout the campaign, demanding the jailing of the president’s associates accused in the scandal. 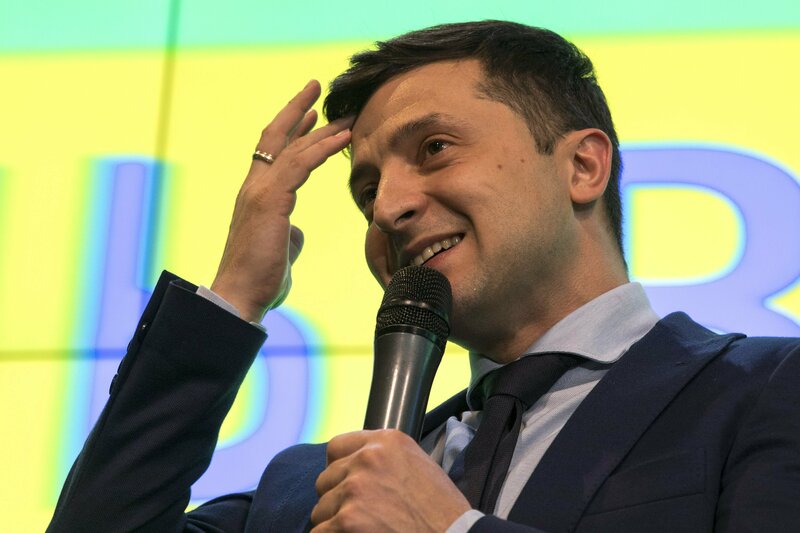 Zelenskiy quickly shot back, saying mockingly that it’s impossible to say whether a corrupt official involved in the military embezzlement scheme was Poroshenko’s puppet, or the other way round.